I've been going over new curriculum and teacher's manuals all evening, and I don't have so much as one lesson plan actually down on paper yet. I somehow need to find that "back to school" mentality, cause classes start next Wednesday. Usually it comes, but this year, so far, it hasn't. Maybe tomorrow--I have about four hours of meetings, so maybe that will put me into that back to school frame of mind. I can only hope, but am NOT holding my breath! Meanwhile, I have some dishrags and yarny goodness for show and tell. For some reason, all I wanted to do this weekend was make dishrags, so I did. I'd been wanting to try a round one, and this pattern was fun and easy. I like the way it turned out. I will definitely make more of these. This one is pretty basic, but it has a nice texture and it made up nice and quick!! I'm not quite sure what I think of this one. This pretty stuff is the new Jitterbug sock yarn from Collinette. It's soft and feels like it will be great to work with. Now if I can just get this sock thing down. Right now I'm avoiding working on mine, and I don't know why. I think it's because I have this fear that they're going to be too big when I get done and I'll end up having to frog the whole sock. Other than that, I've been enjoying my little venture into sockdom. I have no clue what I thought I'd make with it, and I don't do bright and neon colors, so why in the world did I order this??? Anyone??? Oh, well. Matters not. It's beauteous, and if I can't come up with an idea of how to use it, maybe you can. I'd love to hear your suggestions! It's SOO soft---after fondling it a bit, I buried my nose in it and inhaled deeply. Ahhh, good stuff!!! 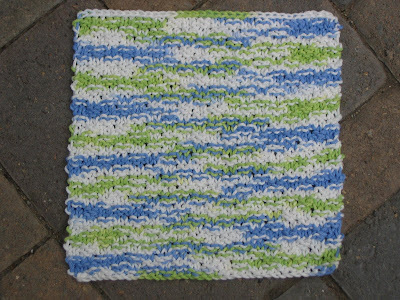 Beautiful dishrags! My favorite is the last one. As for the socks I usually try mine on as I go and when the foot of the sock is just to my little toe I know it's time to start the toe shaping. Then you'll have a perfect fit every time. Love Malabrigo yarn! I've made some very cozy scarves with it and last year I made some cozy fingerless mitts. Oooo, I love that yellow/pink cloth with the diamond shapes in it. Cloths are just so much fun and it is such quick satisfaction. I have heard of the mobius and have seen it worked on the show Knitty Gritty on DIY Network. That would be an interesting way to work up this yarn. The one skein has loops in it so it may be a bit of a challenge...thanks for commenting on my blog. It's good to know people are checking it out. How're your socks coming along? Gorgeous Malabrigo!!! A fun hat? Love the dishrags - what's the pattern for that last one? Beautiful!! 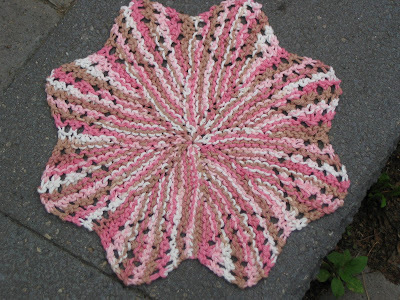 I love the pink and brown one- can you share the pattern? Hmmm, could the mystery yarn be used as part of a felted fall bag? The colors are gorgeous! I love to make dishcloths too. One day I'm actually going to keep one for myself! 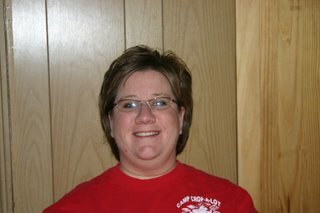 I echo Allyb - thanks for commenting on my blog! 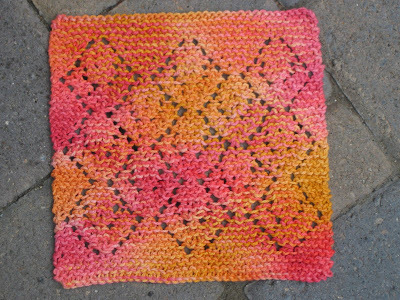 You must edit this post with links to the dishrags, I love the patterns! 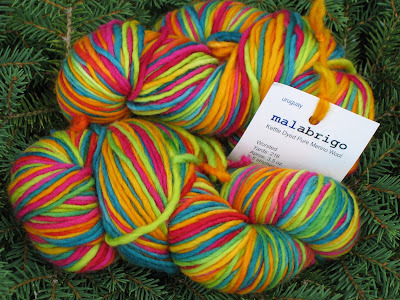 The malabrigo could make a fun felted purse! I'm chiming in with the rest of these comments about your fabulous dishrags and the need to post the delicious patterns. For the Malabrigo, how about the "Touch of Whimsy Scarf"? 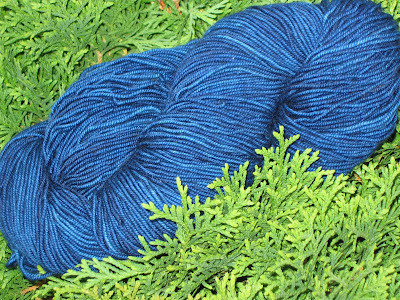 You can google it, or I did one with a blue colorway Malabrigo. 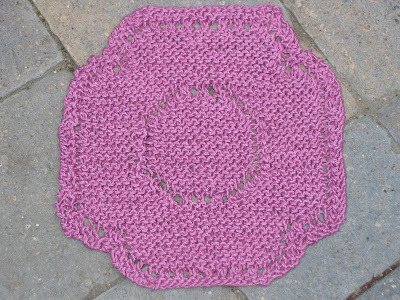 It turned out lovely and was so easy to work with the yarn in that pattern. Really like that first dishcloth..neat desing. Oh I love the neon colors..I could see scarves and hat or even a cute fun bag!